This will be a big week for me and the outside cats. My big goal is to trap Mama Kitty and her kittens on Wednesday night so they can be neutered/spayed on Thursday. Once they are recovered from their procedures, they will be released again to their yard. Nahum and Willow, finding a near-perfect way to get through a rainy Sunday. I have been getting help in this process from two local cat-loving women, Nancy and Sue. Nancy has been answering all my questions and giving me tons of information on how to successfully trap ferals. She also arranged for the spaying/neutering and vaccinations to be done at Purrfect Pals (my local amazing cat-only shelter). Sue has graciously loaned me two traps and offered to shuttle the trapped cats to and from Purrfect Pals on Thursday. I am deeply thankful for both of these amazing women. The traps are scattered out in the yard, their doors temporarily wired open. I am feeding the outdoor cats now exclusively inside the traps, getting them accustomed to being in the traps. I don't like for cats, indoor or outdoor, to be uncomfortable. It rains a lot here in the Pacific Northwest, so, I've been trying to figure out how to keep the kitties dry and comfortable when they are eating in the traps. Sue suggested duct taping trash bags around the traps. I tried that, but I had to make cuts in the bags for the handles and to access the guillotine door which has resulted in leaks. High up in the mountains, the railroads build snow-sheds over the tracks to keep the heavy snows and avalanches from blocking the tracks. I decided to cobble together a few rain-sheds to sit over the traps to keep the rain from falling onto the traps. They won't win any awards for beauty, but together with the plastic they'll do the job. Before covering the traps with the rain-sheds, I had them all under the large raised planter. But then I learned from Nancy, that it would be better to have them not so close together. So, here is the current configuration. 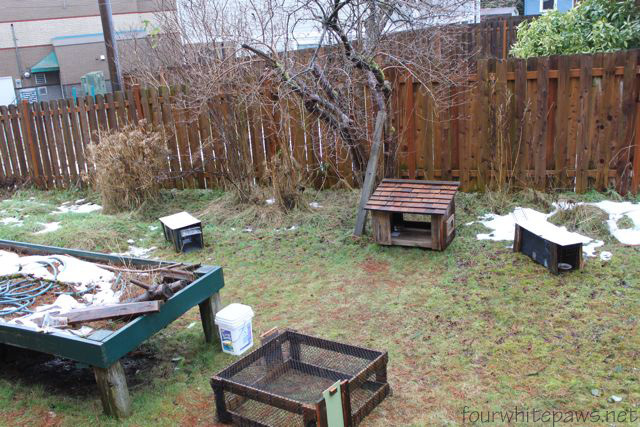 One trap remains under the planter, the other two are scattered in the yard. I put the drop trap out there as back-up. On Wednesday night, I'm not sure yet what I'll do with Oliver so he doesn't go into a trap. In the past he was weary of the traps but now that he is being forced to eat in them, he might be less fearful. That little detail still needs to be worked out. I'm feeling pretty anxious about trapping the ferals. I know as Wednesday approaches my anxiety level will go through the roof. Having the help has kept my anxiety lower so far, I hope that continues through the tough part. My anxiety comes from causing the ferals short term suffering, even though I know it's for the best long term. I also fear I will only capture one or two and then will have to figure out how to get the other. I know the anxiety won't stop me, but it's not pleasant and it's helpful to acknowledge it's presence. I'm trying to focus on the memory of successfully trapping Oliver to help me through this. 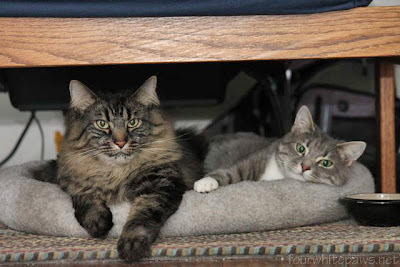 These cats are not experiencing any anxiety! Willow, Nahum and Rose all snuggled up together in a cat bed in front of the fire. Now this is the perfect way to get through a rainy Sunday! I wish there was room for me in that bed! I'm going to spend some time reading up on TNR this afternoon from the Alley Cat Allies, Conduct TNR Guide. If anyone has any tips or pointers about trapping ferals, I would love to hear them. Good luck to you on your mission of catching and helping those kitties. What a wonderful thing you are doing. 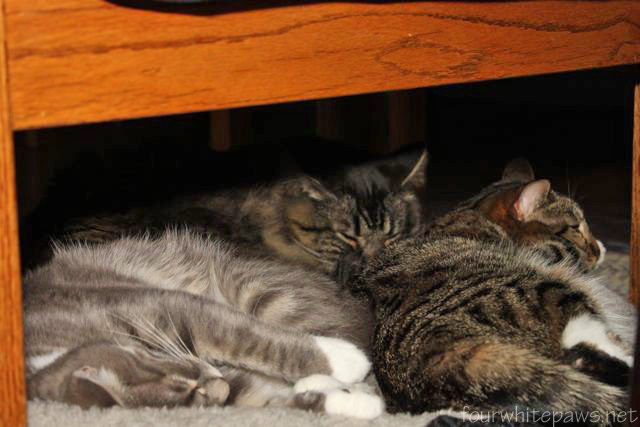 And look at how cozy your kitties are! A warm bed by the fireplace - most enjoyable! I imagine that everyone will say something very similar to this...I am proud of you for attempting to trap these ferals so that they will have a better chance in their lives and my heart was moved that you care so deeply for a cats' comfort. That is gold and gems in today's world. Thank you for what you have done, and what you are attempting. Good luck! What you are doing will help those kitties!! Our mom remembers when she trapped Zoey. She was so nervous and thought it might take days. It took all of 10 minutes!! We hope yours goes as smoothly! I'm so glad you found those ladies that are helping you. I've never done this before either. I can imagine how anxious you are but it's so great that you're doing it. I also think it's wonderful that you're doing a lot of reading on it. I wish you the best. Just so you know, once the cats are fixed and returned they might seem to avoid you for 1, 2 or possibly 3 days but then they WILL be right back looking for you. It is VERY common for that so be expecting it. Not all ferals will 'disappear' for a few days but most do. I just don't want you to worry if they aren't seen right after you release them, trust me...they know a good thing when they see it :) Good luck ...you are in great hands with Nancy and Sue! I wish you loads of luck! Too bad you can't bring Oliver in overnight?? Good luck!!! Hopefully you can get them all in one shot. Mom laughs cause we have trapped the same black male several times....he just has no fear of that live trap. It can be hard to see them in there and freaked out, but it really is better than more kittens....mom puts a sheet or towel over our trap so that it is dark in there and that helps calm the kitty. Good Luck. I regularly trap in Vancouver, and we cover the trap with a towel or old blanket (sides only, not the ends) and then a tarp over that. I have enough of the tarp that I can lift the handle with the tarp, and I always set the trap before covering it. Not too sure about the best way if you are using a drop since I haven't used one. I am currently working with several rescue groups in our area (Puget Sound, Washington) to put on a series of free classes specifically to teach people how to do TNR. Phil is coming to our class, but I think he will have most of it down pat already :) We are developing a mentor/support network to help people new to this; those of you who have trapped before know the uncertainties in the beginning can be overwhelming. Anyone can come, let me know if you are in the area and I'll give you the info - or get it from Phil, since I hope to develop a good working relationship with him! Phil, I may use your story as an example in our training - is that okay with you? See you soon, and thanks for all you are doing! It's wonderful what you're doing. These kitties are SO lucky. You, too. Take lots of deep breaths...it will work out...everybody will be happier, healthier, and safer. And you're going straight to heaven. YAY PHIL! And Laura too! What a fun thing to read the whole process step by step - I felt like I was right there! I have to say, you have the luckiest little feral colony I know of - I can't wait to hear if you have boys or girls - or both :) And I'm awfully glad you did this now, so you don't have MORE in your colony in a month or two!